I've meant to ask Cronin this question for years. It's easier now. UC is in the Madness for the second year in a row, and is favored to escape Round 1 again Friday, against Texas. Mick's height is hardly an issue. Still, your stature shapes your personality. To an extent, what you look like is who you are. 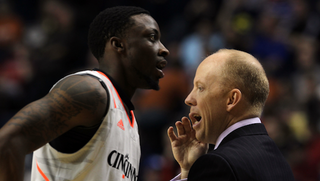 It has to have been harder for Mick Cronin. And truthfully, it has to have made him a better coach. Cronin said he has never thought about it. Seriously. Point taken. Except Wooden was Wooden and Pitino has a personality that could simultaneously charm snakes and kill them. Van Gundy, I have no idea." His father, Hep, knew Mick's playing days were done once Mick's legs started sprouting hair. "In eighth grade, I had more hair than Chewbacca,'' Mick allowed. Hep suggested Mick take up golf or dedicate himself to baseball. "I was devastated,'' Mick recalled. "That's a bad combination,'' Hep said Thursday. So, I got my answer. "In the coaching realm, my height hasn't been a factor. Kids know who cares about them, and who knows what they're talking about,'' Cronin said. The height thing is no thing. Plus, when Cronin gets on an airplane and flies across the country, his knees don't feel annihilated when he arrives. Travel is tough. The Cincinnati Enquirer has paid to send Daugherty to Nashville to cover the Bearcats, so he can supply the insights you only get with in-person access. Lookit this coach! He's totally not tall! And now the coach has been made aware of that fact. Whether he cares or not.